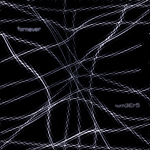 Silber shows it's black darkwave roots from when we still had hair with a five minute EP from our friends fornever. fornever takes a dramatic tact with ‘numbers’. What results is a sad little collection of songs. Aspects of the sound appear to take up far more space. Every track builds off of the last. Rather these form a coherent whole of a single track. Together the pieces become considerably stronger. Nestled within these tracks are obvious nods to shoegaze, post-rock, and Goth. Putting them together creates a full experience. How the atmosphere is changed for each one indicates a greater story, with this release as a mere chapter. ‘One’ begins it with a rather sky-bound approach towards songwriting. The guitars soar. Little drum elements make their way into the mix ever so gradually. Wordless it manages to convey the sense of loss. ‘Two’ expands upon this theme. Gone are the rock elements and instead it takes a more electronic, industrial vibe to the proceedings. Drums here are synthetic. Synthesizers play a theme similar to that in ‘One’. By the middle ‘Three’ things are ambient. This is the interlude of the album before the longest track ‘Four’. For ‘Four’ things are considerably more colorful. Elements from the previous tracks make their way into the general sea of sound. Vocals manage to sound appropriately defeated. Despite the gloom of the vocals there’s a specific sense of hope. At the end ‘Five’ fornever returns to the beginning rock ambitions. Unlike the beginning there’s a true sense of accomplishment. Mixing in more electronic elements indicates what happened previously and by ending it with electronic distortion it is able to once again reach to the sky. US project FORNEVER have been around since 1995, and is the creative vehicle of one Joshua Heinrich. Since he started producing music under this name dozens of releases has seen the light of day. “Numbers” is an EP from 2013, and was released on US label Silber Records as a part of an experimental series of EPs made under the condition 5 songs in 5 minutes. Fornever have opted for an interesting take on the challenge presented to him, by basically constructing a five minute song divided into five different parts when the song takes on a new movement. A five minute long, multiple themed construction with a structure you’ll normally otherwise primarily encounter on epic length material. It is a very well crafted song too I might add. The initial movement with textured circulating guitars and a growing noise layer, shifting to strongly Depeche Mode inspired sound with gentle dark vocals, enticing beats and frail piano supplemented by synth textures and a concluding synth solo that transports the song into the next phase. Dual layered synth textures supported by frail piano is the setting here, while the next movement brings us back to the Depeche Mode inspired movement, now supplemented by an additional chilly synth texture. The composition concludes with a revisit of the opening theme’s guitar motif, now supported by the same drum patterns as the previous section. A highly successful production, and one that comes with a logical recommendation to fans of artists like Depeche Mode first and foremost.